My master degree thesis dealt with the patterns of genetic connectivity of bicolor damselfish (Stegastes partitus) populations in Central America. The results indicated that there is weak but significant genetic differentiation, suggesting some restriction in connectivity along the Central American coastline, consistent with bio-oceanographic model predictions of fish dispersal. These results were published in Marine Biology in 2010. As part of that research I have also been looking at techniques (assignment tests, parentage, relatedness) to understand if fish larvae come back to their natal reefs. I am extremely thankful to my advisor Helena Molina, my host University of Costa Rica, and to Dan Heath of the University of Windsor, where I was able to perform the genetic analysis. All my work would have been impossible without the scholarship from Peter Sale of the United Nations University, chair of the Connectivity working group, of the Coral Reef Targeted Research and Capacity Building for Management Program (CRTR). 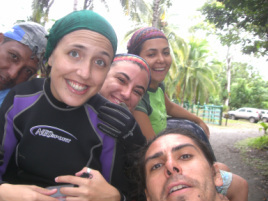 As part of my undergraduate research, I participated in the monitoring and assessment of coral reefs from Costa Rica. Costa Rica is an amazing country for a marine biologist, because it has both the Pacific Ocean and the Caribbean Sea. Here, those oceans are only separated by less than 150 km, but their marine fauna has been completely separated by land for about 3.5 million years!!!!!! The consequences for the marine fauna and the environmental conditions were profound, and it's a great place to study evolution and climate change. I was lucky to participate in the Costa Rican chapter of the Caribbean Coastal Marine Productivity Program (CARICOMP) and in the monitoring of Pacific reefs in Bahia Culebra, Gulf of Papagayo. These monitoring programs are leaded by Jorge Cortés, from Centro de Investigación en Ciencias del Mar y Limnología (CIMAR), University of Costa Rica. During that time I had opportunities to look at the reef fish community structure using visual surveys. I am really thankful to Jorge Cortés and CIMAR.